Posted on Mon, Feb 7, 2011 : 7:45 a.m. I have to admit, I didn't hold out a lot of hope for the new card game Pirate Fluxx being very good. I like its original version, Fluxx, and so I bought Zombie Fluxx a number of years back and found that it just wasn't as good as regular Fluxx. So when I heard that a new version of Fluxx was coming out, I knew it was a try-before-you-buy situation, since there's really no point to owning the same game twice in the same way that you wouldn't buy Monopoly: Grand Rapids and Monopoly: Detroit. After playing, however, I'm happy to report that Pirate Fluxx is the best edition of Fluxx that I have played. For the Fluxx uninitiated, let's see how this card game works, and for the Fluxx veterans, let's see what makes this version better than the original. In this game in progress, each player has gotten a few Keepers in front of him that may later match up with Goal cards to help him win the game. 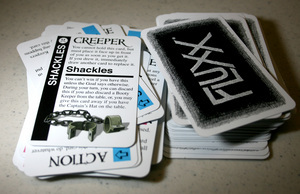 Fluxx is a game that starts with easy rules: draw a card, play a card. One of the cards that you might play is called a Keeper card: a card that stays in front of you. Another card you might play is a Goal card. A Goal card will say which which Keeper cards you need to have out in order to win. You can also play New Rules cards that will change what you're allowed to do in a turn: usually they result in you drawing or playing more cards on a turn. Action cards call you to perform an action that varies based on the card. You may, for example, end up drawing two cards and playing them instantly whether you want to or not. You may also get to steal the Keeper of your choice, perhaps getting you closer to the current goal. If you haven't played it, Fluxx is a pretty random game, and for this reason it is quite polarizing. Those that dislike the game dislike it with a passion for its randomness and lack of meaningful decisions. Those that like the game (that's me), like it for being a fun and quick game. One of the great things about Fluxx is that each card tells you all that you need to know in order to play it. I played my first game of Pirate Fluxx without even opening the rule book. Regular Fluxx is about getting the right cards at the right time. If you have Keeper X and Keeper Y, you win! The Keepers are all basically the same other than having different names. 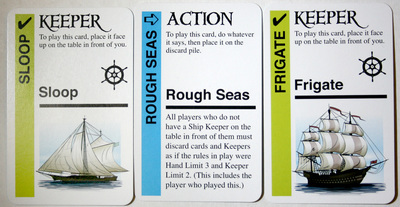 In Pirate Fluxx, however, there are a few different types of Keepers that fall into different categories. 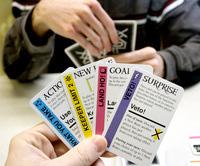 The action and rule cards reference these cards in ways that have different effects. Pirate Fluxx has four different ship keepers that might go in front of you if you choose to play them. If another player looked at the current game state and chose to play a Rough Seas Action cards, players that didn't have a ship Keeper might find themselves forced to discard cards. Similarly, some cards — diamonds and rubies to name a few — count as booty Keepers. These Keepers are different in that you can hide them from other players if you get a Treasure Map card; furthermore, there is a Shackles card that prevents you from winning the game that you can get rid of if you discard one of your booty Keepers. The one thing that I don't like about Pirate Fluxx is the Talk Like A Pirate card which reads, “If you speak with an outrageous Pirate accent during your turn, Draw 1 extra card. Draw 2 extra cards if you've been continuing to use your accent since your previous turn.” Other people like the silliness that this adds, but I personally am looking to play a card game that doesn't involve having to make silly voices. From talking to other people, however, I seem to be alone in this sentiment. Fluxx is a great time-waster of a card game. There is no way to be good at Fluxx given the randomness, but there are certainly times where one play might be better than an other. Regular Fluxx is fun. 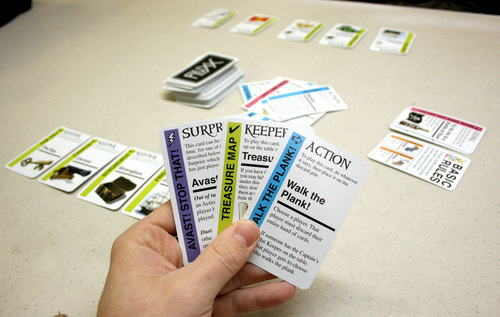 Pirate Fluxx takes all the elements that make regular Fluxx fun and then adds a little to the other aspects of the game that before didn't do anything: now your Keepers do something, now you can interrupt other players, and now more cards care about the Keepers that are out in play. I have a hard time really putting my finger on what makes Fluxx fun. It's sort of like asking an Uno fan why they like Uno; it's an enjoyable experience but really hard to pin down exactly what elements make it fun. If you've never played Fluxx, it's definitely worth a play. I gave Pirate Fluxx a try over at Get Your Game On where they have a demo copy open for anyone to play any time and an event this Saturday (the day the game is released) where people are on hand to teach the game and players get a free promo card. So, perhaps for the first time in Critical Hits history, when I say "You should try this game first to see if you like it," I finally have a practical way that you could do so. If you have played Fluxx and don't like it, Pirate Fluxx isn't going to change your mind. 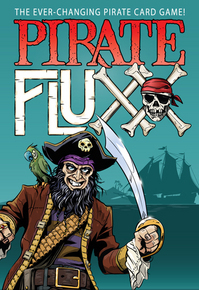 If you are already a fan of Fluxx or like the sound of it, you can't go wrong with Pirate Fluxx. Mike Hulsebus will be removing the Talk Like A Pirate card from his version of Pirate Fluxx once he buys it after work on Saturday, but you can still e-mail him with a pirate accent at mikehulsebus@gmail.com.